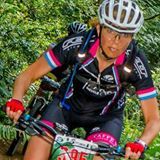 Sandrine McFadden joined our team this spring and has kept a very active training and racing calendar so far. Her main race focus is cyclocross, but she has been getting more involved in mountain bike racing this spring. Check out her race reports from three big events! Since joining the team I have done a few races, all for fun in preparations for cyclocross season. The most memorable ones so far are the Sea Otter Classic, Northwest Epic Series Race #1 “Stottlemeyer”, and the Oregon Enduro Series race #1. The Sea Otter Classic was a blast, even though it did not go as I had planned. I went to Sea Otter primarily for the cyclocross race, but since I was going to be there for an extended weekend, I ended up signing up for the circuit and the mountain cross-country races as well. Day 1 – Friday: Circuit. The Circuit race took place on the Laguna Seca racetrack. Though the course had a nice long steep hill (I am a climber so “yeah, bring it on!”), it was fast and the heat gave us a beating. I was ready, and had a new pair of sweet wheels! … Zipp Firecrest! Those wheels rock is all I can say. Anyways, I was signed up for the master women 35+ and the race was to last a period of 50mn. At the starting line, our group was lined up to start behind 3 other groups; there was a 30 second gap between each group. My race strategy was to keep calm and in contact for the first half then just go as hard as possible for the second half — and hammer the hill. Unfortunately, my strategy failed as most of my group and many other racers were pulled at about 22mn into the race. What a shame! The only reason we were pulled is because the Pro Men group, who started 1mn30seconds before our group, had gained 3mn on us. Yeah, a minor detail/rule that was not announced at the starting line; if we were to be 3mn behind Pro Men, then we were to be pulled. Upon getting pulled, many women were furious and rather vocal about it. I kept my calm and thought, “lesson learned.” Though it was a super short race, it was just awesome. I look forward to giving it another try in 2014. I did finish in the top 10, 9th place. Day 3, – Sunday: MTB cross-country. I was a bit nervous, as I have less than a year of experience in riding MTB but I was determined in giving it a try. My “daughter” kept telling me that I was going to kill it and was ready for it. I was signed up for the beginner cross-country MTB course. I was told that is was a super hilly course (sweet for me! ), not too technical. I showed up for my 9:30am start time only to find out that there was a misprint on the schedule … it was 9:30am for the first group heading out … darn it. I was all warmed up. My start time was not until ~10:30am. Eventually, we lined up. While waiting, I was told to be ready for “the wall”. “What”, I thought to myself. I know about “wall climbs” for Road Racing, but not for MTB. The gun went off, and the pack quickly broke up before we entered the singletrack. I was in a good spot, top 10. The heat and loose dust made breathing interesting. We quickly caught up and passed many riders from groups that had started before us. Then the “wall” came up … you could not miss it … it was a line of riders pushing their bikes, sweat dripping and a few nice words could be heard. After the wall, it was a lot of “up” and “down”, very little shade if any; the “downs” were steep and the “uphills” seemed to get steeper and longer as we proceeded through the course. I was surprised to see the number of riders pulled over due to cramping. Eventually, we reached the end and it was another top 10 finish. This race was a great experience and gave me more confidence in my MTB technical ability, so I proceeded to sign up for Stottlemeyer, the first race in the Northwest Epic Series. As race day got closer, I began to get nervous. Last year, when I raced Stottlemeyer, I ended up finishing well behind most racers. I kept telling myself that my skill has improved and to just focus on my personal goals, rather than the other racers. So, my goal was to finish the race faster than last year, walking ONLY if absolutely necessary, and riding across all the bridges. Last year, I only had been riding MTB for a week hence this race was definitely an Epic race for me. Well, I finished it 48mn faster than last year, placed pretty well, rode at least 95% of the course and rode all the bridges — so I met all my goals. As a matter of fact, it left me wanting more … so my “daughter” and her teammates talked me into signing up for an Enduro race. This was my first Enduro Race. This kind of racing is crazy but super fun. We arrived Friday morning so we could attend a clinic with awesome pro race Lindsey Voreis. The clinic was excellent and was a nice refresher of what my other pro racer friends/coaches have been teaching me. Post the clinic, we decided to go pre-ride the Saturday stages. What did I get myself into??!!! It had been raining the previous days so it was super muddy–deep mud that would just grab your tires and yank you. By the time we were done with pre-riding stages 1-4, we were covered in mud. Four out of the five of us had taken a roll in the mud at least once. The next day we got up and it was hot! Amazingly enough, the trails had pretty much dried up, with the exception, of course, of the Rock Garden. The Rock Garden was Stage 2, and the one stage I was most worried about. I was told to just walk it. Well, walking on super slick, wet, sharp “rocks” on a very step down, twisty slope, with roots, trees of course, and a huge drop in the last turn was a challenge in itself. I did ride the first ~200 yards then pushed/threw my bike for the rest. The drop at the end of this stage was taller than me, and it started with having to roll off a large tree log. How bad was it? There were numerous crashes at this stop throughout the day, and a warning sign saying, “DROP!” Then there was stage 3. It was probably my fastest ever downhill ride of this type. It was a blast, though I did scare myself good because it was a good 8mn of huge banks (bigger ones than I have ever seen or ridden) followed with double “humps” … I hit the first set of “humps’ too fast and caught some good air then somehow managed to land without crashing. Then, to finish day one, there was stage 4. It was another single technical track course with super steep down slopes. 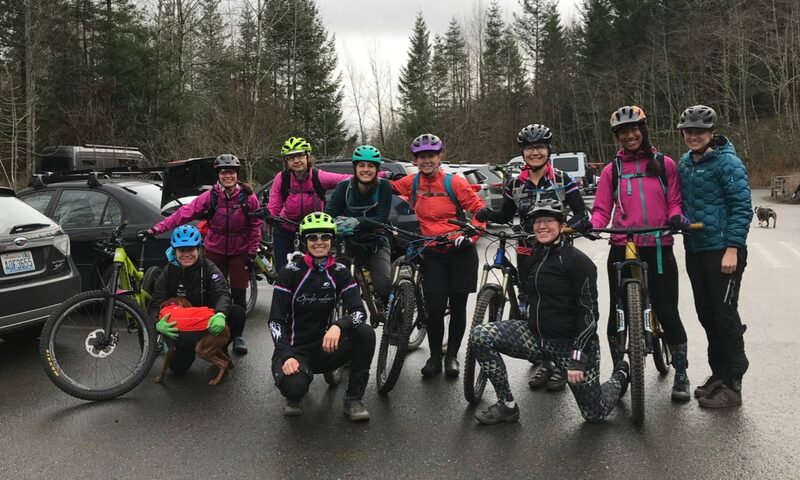 “What did I learn from this amazing experience?” If you are going to race Enduro, you need a bike that will allow to pull the saddle all the way down, preferably a bike with good clearance, flat pedals if you are new at it, and if it is going to be muddy, then plan on mud tires. I was told, at least twice at the start of each stage, to pull my saddle down … well, my saddle WAS all the way down! My bike is setup for cross-country racing and the seat-post was replaced with a longer one to allow for a proper fit. Would I do it again? Yap, especially because I loved the transition stages. What’s next you may ask? Well, cross season does not start until August, so I plan to do a couple of the FAT Tire Revolution series MTB races, possibly the “Little 150” with the team, and the WSBA TT championship in August. Here’s a race report from Alli Greening, recounting her experience at the recent Capitol Stage Race. I had quite a late start to my race season this year due to a major professional exam in late April. I started a low volume, high intensity training program shortly after that. Then, two weeks in, raced Mutual of Enumclaw stage race, an absolutely great race that I had no business doing! Two weeks later I did the Capitol stage race, in Olympia, which was another great stage race without the strong pro field that Enumclaw had- phew! It’s always rough as a cat 3 racing with 1/2’s, but bona fide pro’s make it a little ridiculous. Still, I knew it wasn’t going to be pretty, with a short prologue, evening crit, and 67 mile road race the next day I would do my meager weekly mileage over the course. The TT was only 6 km, a distance I never feel like I’ve gone hard enough over or have warmed up enough for. This was no exception, especially since I really didn’t get enough warm up, only a little over 15 minutes. Nonetheless, I wasn’t last, which is pretty good for me; even when I’m going well I often finish DFL in the TT and then have pack finishes in the crit and road race. I put on my compression tights and vowed to get to the crit in plenty of time to get a good warm up. I arrived at the crit plenty early, and since the whole thing was close to home I had actually had a nap in my own bed (with the cats!) between stages and felt pretty recovered. I spent a few minutes getting things out of the car, put my skin suit half on, and then rolled down to sign in before I started to warm up. I was surprised that all the women were already signed in, the race wasn’t for a full hour. Then I turned around, and saw my entire field, minus me, lined up at the start! Whoa, WTF?! What was going on?! I yanked off my t-shirt and pulled up my skinsuit, and lined up at the back just as the official was “reading us our rights.” The word, “holy shitballs,” went through my head. The crit started. Suddenly my goal was simply to not get time cut so I could race tomorrow. I got dropped pretty quickly, as my shocked legs protested mightily. After I got pulled I went back to the car and checked my race bible again, trying to figure out what had just happened. It really said 7:45. I took it down to one of the officials, who didn’t have an answer for me either, he said he was very sorry, but didn’t know where my copy of the bible had come from. Everyone else had managed to show up on time. Later one of the women said there had been email communication about the change, which I either hadn’t seen or gotten. Again, I put on compression tights and vowed to arrive in time for the road race the next morning. The road race was 67 miles, and I couldn’t remember the last time I had ridden 67 miles, much less raced it. Certainly not in the last 12 months! The best I had done was a couple of 45 mile training rides with some long, moderate intervals recently, which would have to do. The race was a modified out and back, with a loop at the far end. I was pretty sure I’d get dropped before the turn around and would simply ride backwards on the course to DNF. At the start everyone seemed a bit concerned about the distance, though I thought to myself that they would feel much better if they only knew how unprepared I felt! We started, and after a neutral roll out things heated up a little, but stayed together until before the first climb. Team Group Health had about half the field in their kit, and clearly had a plan. They started attacking and things spread out, eventually I got dropped, but at the top of the climb found a capable looking wheel to sit on. She subsequently turned out the most impressive chase back on I have ever seen! It was amazing to just be sitting on for it! I apologized and said if I’d gone to the front and tried to help we both would have still been off the back! As we rolled along a couple of the TGH girls who had attacked early made their way back to the pack as well. We rolled along, occasionally surging a little, until the turn around, where I thought for sure I’d get shelled as people attacked coming out of the turn. The turn was no biggie, and I realized as we started the loop I was committed to 67 miles, with or without the rest of the race. Gulp. We got quite fast and strung out for what felt like 10-15 minutes, but I was able to sit on and then we settled down a lot as suddenly no one wanted to work leading into the first, and gentler, of the two climbs on the return. Then it happened. I blew hard, the race went up the road and I was left out there, all alone, with a good distance and one and a half climbs to go. I could barely do more than soft pedal. I suffered up the stupid hill and then asked the corner marshal at the next turn how much longer this time trial was- he laughed and said only about 10 miles, some more descent and then a stout climb. I kept pedaling as the vultures started to circle above me and the wolves started to close in. I finished 15 minutes off the back, but it felt like hours. At the finish the pro 1/2 men were just finishing their own 90 mile sufferfest that they had started long before us. I was stumbling around in a stupor when one of the guys came up to me, in an equal stupor- I recognized him as an old friend I’d raced with in NM a decade ago, who I knew had since moved to Portland and turned pro. As excited as we were to see each other, about all we could do was grunt and making conversation seemed impossible. We vowed to try to see each other again before I moved out of the area later this summer. It’s now two weeks after Capitol, and I’m heading out to test my legs again this weekend, with two road races, probably the last I’ll do the the PNW. Today is only 44 miles, but promises to be a punishing course with lots of hateful little climbs and a longer one each of the 5 laps. Tomorrow is a race in OR, with a separate women’s cat 3 field, and a chance to see Josh, my friend from NM again.